In today’s “bring-your-own-device” work culture, the office supply shopping list has grown a little shorter for the modern business. But there’s one piece of hardware that every business can’t do without: an office copier. According to Laser Line, a copier repair and printer service in Jessup, MD, it’s important that businesses select office copiers that can meet high-volume demands, require little maintenance, and have a long lifespan. Printing Demand: If you have a small office that requires occasional printing, you may be able to do fine with an inkjet printer. However, these models can carry high ink replacement costs and may not be able to handle large printing jobs. If you need to print regularly without a drop in quality, consider a color copier that offers laser printing, such as an HP laser printer. Wireless Connectivity: Whether your employees are bringing their own laptops or you have an office full of desktop computers, it’s important to choose an office copier that can easily connect to devices across the office. For this reason, wireless copiers and printers remain a top choice. Scanning & Faxing: Office copiers don’t just print documents — they can send and store them to your office database. If your business requires contract exchanges or documentation, make sure to purchase a multi-function copier that can fax, scan, and print. For heavy-duty projects, choose a model that offers high-speed scanning. Paper Sizes: If you produce documents that don’t fit on standard letter-size paper, you’ll need an office copier that can accommodate multiple dimensions and materials. Servicing: Office copiers should be able to stand up to intense printing at all hours of the day. But if there’s an issue with the hardware, operations can come to a halt. Make sure you have a model that comes with a warranty and service agreement — or work with a managed printer service. 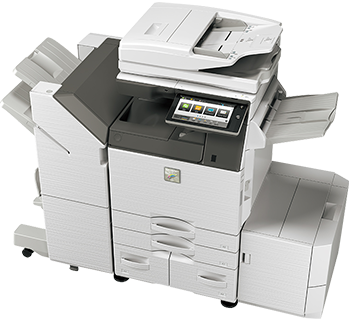 Whether you need to buy a new office copier for your company or need repairs on an existing model, call Laser Line at (410) 636-1700 for high-quality copier and printing services in Jessup, MD. To learn more about the products they specialize in, check out the equipment listings on their website.